I’m sure that anyone who has learned CPR knows who ResusciAnne is. Just hearing that name flashes me back to high school health class, where I had to put my mouth on some plastic girl’s bleach-flavored lips. It would appear that someone is giving traditional CPR training a makeover with the addition of a PC application and Wiimote. So when you push on ResusciAnne’s chest, the motion controlled joystick interprets it as correct or incorrect chest compressions. I realize that this headline might trigger surveillance society fears in some of our readers, but this article isn’t about putting GPS trackers in everyone’s footwear. No, putting a GPS in someone’s shoes is only a way to keep tabs on those who need it. GTX Corporation and the shoe company Aetrex originally developed this technology to track elderly patients who have Alzheimer’s. For those who do not know about Alzheimer’s, it is a condition (not a disease, even though it is often referred to as one) that involves both short and long term memory loss. Sometimes the victim is really lost in his or her own world of the past, and doesn’t realize he or she is very much in the present. In short, a victim can be as helpless as a wandering infant. I’m sure some of you have older relatives who have been afflicted with this. 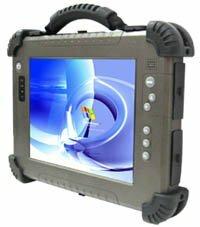 American Industrial Systems, Inc. (AIS for short) has recently introduced a couple of medically certified 8.4” and 10.4” Rugged Tablet PCs that will target the medical industry. Being that small in size, you are spot on if you thought that the famous Intel Atom processor found in netbooks will be the heart and engine of these rugged tablet PCs – they will utilize the latest N270 Intel Atom Processor that offers high reliability operation in an ultra low power environment. On the outside, you will be pleased to note that the tablet PC sports an elegant, practical design that boasts an aluminum-magnesium alloy construction with individually sealed ports for complete IP54 compliance waterproof and dustproof protection. In addition, these two tablet PCs have already made it past the UL60601-1 Medical Equipment Certifications that make them approved where electronic compatibility and reliability in the medical field are concerned. Not only that, AIS has made sure they are tough as nuts by virtue of its engineering that complies with Military 810F shock, vibration, and drop standards. Never knew the hospital environment would be that tought, but hey, you can never tell when your tablet PC might drop to the ground when a patient starts to trash around in bed, right? You should know by now that staying under the sun for long periods of time, especially when it is at its fiercest, just to get a lovely tan isn’t quite a good idea these days with the ever thinning ozone layer even if you have splashed generous dollops of sunscreen over you. After all, no point having a nice tan all over only to discover that you suffer from skin cancer many years down the road, right? Well, for folks who just love the summer sun and can’t get enough of it after the dreary winter months, here’s something that might help you manage your time under the sun – the UV Monkey from Firebox. What’s the UV Monkey, actually? Well, it isn’t some sort of simian creature that shoots out UV rays at people, but is actually a key-fob sized UV ray detector. I was on a beach the yesterday with my kids, and I really wasn’t prepared for a hot day. If anything, I felt stupid for giving the kids sweaters. While the kids were playing, the sun burned me up and I didn’t notice. Last night, I looked in the mirror to see some guy with a pink face looking back at me. Perhaps I should have been wearing one of those wristbands that monitor harmful UVA and UVB rays. 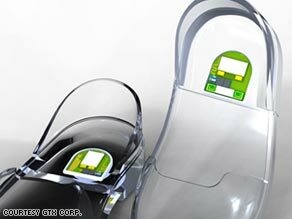 Or, I could take it a step further and get a UVSunSense band. 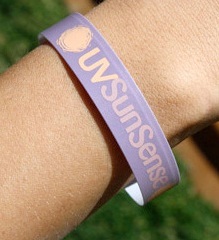 So what makes the UVSunSense different than those other sun-bands? Well, most of those sun bands don’t let you know when you need to reapply your sunscreen. Here’s how it works in a nutshell. 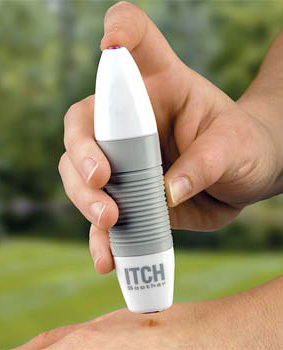 As you put on your sunscreen, you also put a dab of the lotion on the UVSunSense. The band will turn purple in the sunshine, but this color will not last. 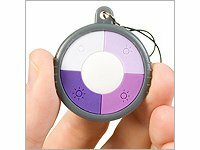 In fact, the user should take note of when it turns colorless, as it will be time to put on more sunscreen.